There are many different practices and theories regarding table food. Like most things in parenting, there is not a right or wrong way. We recommend introducing table food at around six months of age. We recommend real food for young children. Many pediatricians prefer families start with cereal and it can be a good option for parents who are nervous about introducing food. However, we would rather see children eat real food with minimal processing and without additives or preservatives. Children can manage whole foods on their own, pureed, or cut into bites or strips. Typically families first introduce carrots, avocado, squash, potatoes, etc. We recommend introducing one or two foods at a time and keeping track in case your child has an allergic reaction . The most common infant allergies are peanut butter, corn, strawberries, peas, and dairy products. Most pediatricians recommend waiting until after a year for those foods listed, as well as honey. Hot dogs, grapes, and other round items are choking hazards and should be cut so they no longer pose a choking risk. We typically recommend adding table food first without reducing bottles. The calories in the small amount of table food being eaten is actually minimal. In the first couple months of starting food children should still be getting most of their nutrition from their breast milk or formula. Either right after a bottle or before a bottle is a good time to offer food. We recommend feeding table food and bottle back to back as one feeding, so as not to add another meal time. For children that are slower to take to table food, it may be best to offer table food first before the bottle. 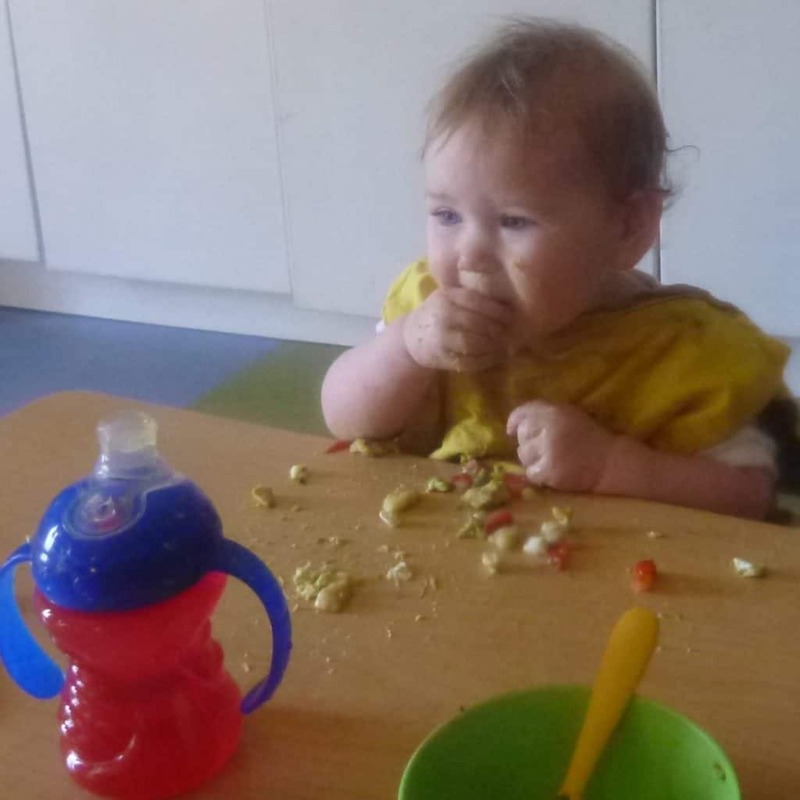 If you want to be sure your little one is getting their entire bottle you may want to do the bottle first then offer the table food after. Once children are consistently eating table foods you can begin to cut back or drop some bottle feedings. Be mindful that your ultimate goal is for your child to eat breakfast, morning snack, lunch, afternoon snack, dinner, and maybe milk or late snack before bed. Once children are consistently eating table food, it is time to start having good food practices. Discourage snacking between meals or using food as a distraction. Encourage children to sit when eating and drinking. Many families stick with pureed food longer than necessary because it is easier to feed children than to help them learn to feed themselves or because families fail to realize that children can move off pureed food so quickly. Children do not need their food pureed. Many new theories do not ever give children pureed food and simply start them right on soft but solid food. Further research has shown that longer use of pureed food can lead to later food challenges including obesity. One reason is both children and adults consume many more liquid calories before realizing they are full. If you started with pureed food, you can begin moving to more solid foods once your child is eating and swallowing with ease. Introduce finger foods that your child can pick up and put in their own mouth. Cheerios, cooked carrot, puffs, small pieces of apple, black beans, blueberries, and cooked squash are some options to get started. Again, remember to think about your long term healthy eating goals as you are selecting foods to introduce.